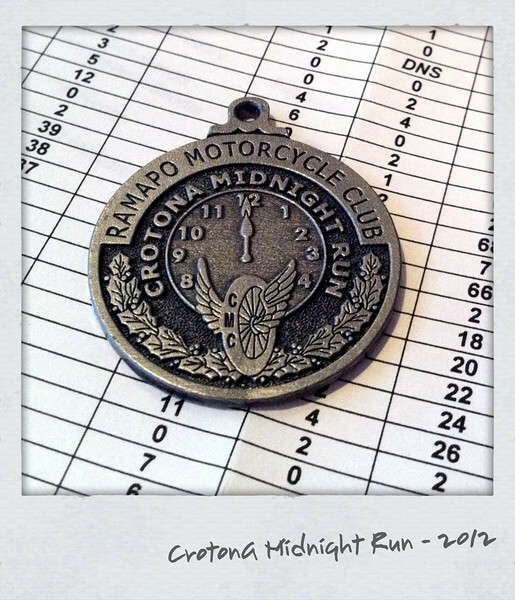 Along with the results came the coveted CMR finishers medallion. Do you smell that? That my friends, is the smell of victory. By the looks of things (unless i’m reading the scores wrong), I squeaked out a finish in the overall top 10. I didn’t do so great on points. I came away with only 972. But that was enough to put me in at the number 9 spot overall. Can’t complain about that. Again, big thanks to Ramapo MC for a fun night out. Can’t wait for next year! That medal is something to be proud of. Thanks, KEith- I’m sorry that you weren’t able to make it this year. That means you’re going to have to comeback strong for 2013! Great job. Nothing wrong with being #9 overall. Awesome medal. You know, I thought about it – but it doesn’t do so hot when there is low lighting. Awesome! 9th is really good for this thing! I bet next year you will be in the top 5! Cool! Good job Rachel. It sound like it was a blast! Thanks, Dar- It really was. You’re so right! I guess the whole idea of “earning” something is such a great motivator. We do patches (badges) and pins quite often but I haven’t seen another medallion aside from this one. Congratulations for your place in the Midnight Run (I was the pax in the side-car outfit who offered gas to you last year in Bedford). We (or me solo) will be back next year. See you then. I’ve been following your CMR blog entries for the past few years and have always enjoyed them. Next year I will look for you at the event just to say “Hi!” Congratulations and keep it up!